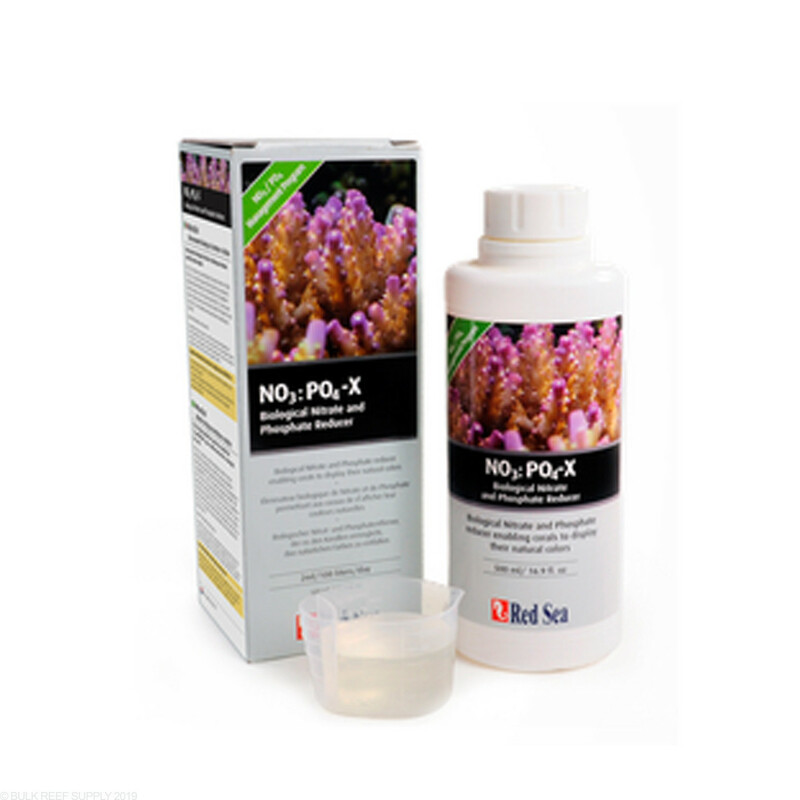 Prevent algae breakouts by removing the nitrates and phosphates in your reef tank. 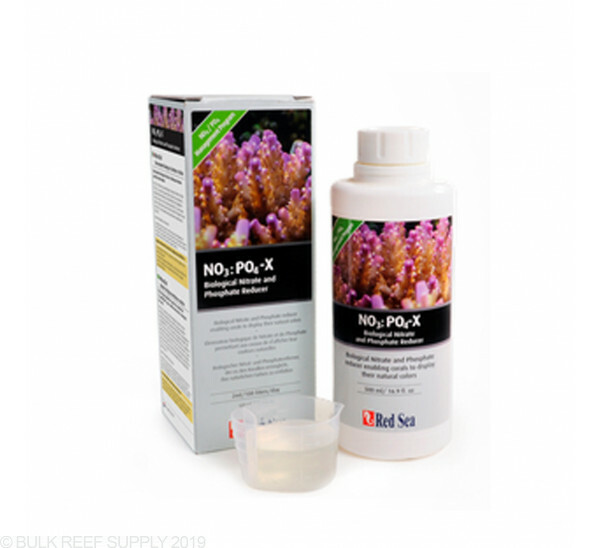 NO3:PO4-X Nitrate & Phosphate Reducer from Red Sea is a complex of carbons each with a different strain of microorganisms in a reef ready solution. 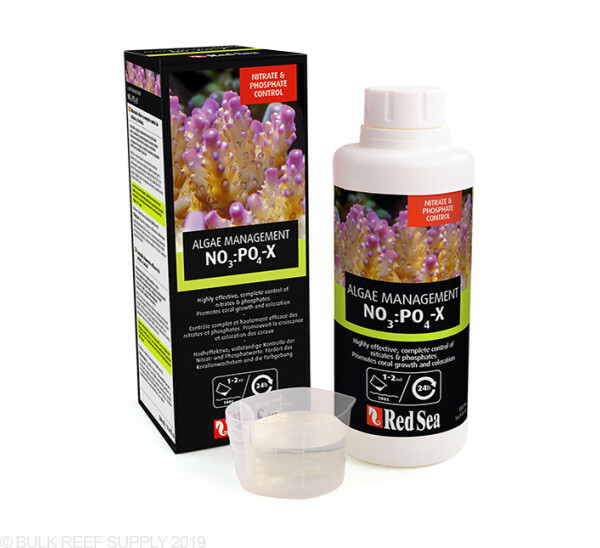 Red Sea's NO3:PO4-x is a part of their Algae Management Program that combines highly effective, controlled biological reduction of nitrates and phosphates for all reef and marine aquariums. Between testing and dosing the proper additives, nutrients in the aquarium can be easily managed with no undesirable effects. 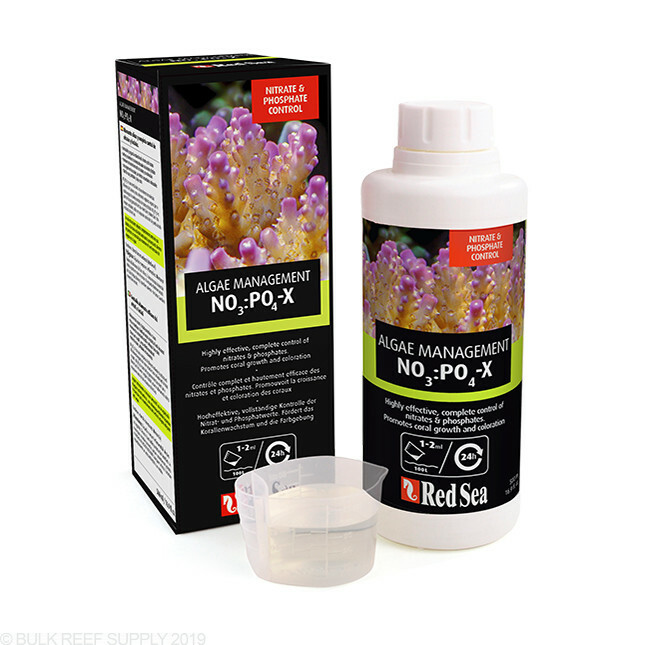 NO3:PO4-x helps promote naturally occurring nutrient-reducing bacteria that already exist in your aquarium. We highly recommend starting with half the recommended dose for your aquarium type and using high-quality Nitrate and Phosphate test kits during implementation. Keeping a steady dosing regime is key, and daily dosing is highly encouraged. We prefer to use a dosing pump system for daily dosing, which keeps the doses very precise and reliable. This product is amazing for nutrient control. Probably hands down the best product I use for my 150g mixed reef tank. In conjunction with my skimmer and bio-pellets my nutrient levels Phosphate and nitrate are rock solid. I used this to counter an out of control algae bloom and it did wonders with the 3 day black out method. Awesome product once you get to know it. I made the mistake by not letting my aquarium cycle and started using nopox to get my numbers down. using the recommended dose i got bad slime and a major dino outbreak. I stopped nopox raised my nitrates back to 80 with sodium nitrate then when dinos and slime stopped and my tank was cycled i only dosed 6ml for my 120 for 1 month and now my phosphate is steady at .06 and nitrate is at 1 and finally I cut back my dose to 2ml per day with heavy tank feedings, my tank has never looked better. word of caution is to use way under the recommended dose and start slow. 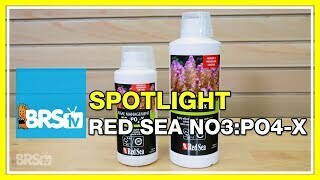 also a great idea to dose red sea energy a and b to keep those coral colors. now that i know how to use this i love it very simple. It kills/hinders the growth of algae as advertised. Dosing 5ml on my 210 since 10ml seemed to stress out a lot of my corals. Within two weeks most if not all of the algae in my tank was gone. I had a massive algae outbreak in a very new tank with only a few things in it. I moved as much livestock as I could to my already very established additional tank, and begin dosing this. Within 2 weeks, my NO3 had dropped, and the algae has cleared up significantly. I have my tank in my bedroom so silence is a must. I've looked into chaeto reactors, biopellets and refugiums - they all had one thing in common, noise from something running 24/7, increased maintenance or spending $$$ on a light that will be on while I'm sleeping. I already dose 2 part through a doser so I got this instead. It doses 4ml at 1PM everyday and that's it. No pump noise, no reactors to clean, no cheato to harvest, no large refugium taking space, and no extra light in the room. I will keep buying until Red Sea stops making this. I had high phosphates from an unknown source and I tried everything to get them down but nothing worked. I tried Rowaphos, ALR 99, GFO, Phosguard, etc but this is the only product that helped me. I add about 2ml once a week now to my Reefer 250 and I never have phosphates or nitrates. I used to use Purigen, carbon, bio-pellet reactor, Chemi-Pure Blue and just about everything else, with frequent water changes, and ALWAYS was fighting NO3/PO4 issues. Got this stuff (which sells like nail polish remover BTW) and I've cut out all other additives and have absolute great water parameters. I wish I would have started using it earlier, had it, opened the bottle and thought "I'm not putting acetone in my tank! ", but finally did and it works wonders. Love the stuff and sooo much less hassle and cost than a bunch of other expensive measures that just don't work very well. This is a great product and is super easy to dose daily on my 60 gal system. It did take a bit to get my system balance, as I had a phosphate imbalance in my system. I added GFO, even though it says not to, to bring the nitrate/phosphate balance inline. Now that the system is stable, I don't even bother testing for nitrates/phosphates anymore. Follow directions don't overdose and make sure you have a high quality skimmer and this product works extremely well. I love this product and my gut feeling is that this works better than Vodka or Vinegar alone. I'm not testing nitrate and phosphate with this, I'm going by visual results and adjusting as needed. The product worked very quickly for me with algae control. I went from having cyano on the sand bed and having to clean the tank glass every day to having crystal clear water, clear sand bed, and haven't touched the glass in a week. This was after about 1 week following the recommended dosage for an SPS tank. In hindsight, I would have started with 1/2 dosage and ramped up to the full after a couple weeks because my SPS were not happy with the change in nutrients. The LPS like Chalices, appear unaffected. I feed my fish 3-4 times per day and will start dosing Reef Energy A+B to help the SPS come back to color. Thanks for getting in touch with us in regards to lowering your nutrients with NOPOX. I am not sure if this would lower it quicker, but I personally would feel it to be more of a stable additive then vodka as its made specifically for aquarium use. I have although seen a few tanks maintained with vodka with amazing results. Please let me know if there is anything else that we can assist with. Thanks! If my tank is running very low to 0 nitrate and phosphates is this still recomended if I want to build benificial bacteria like the product claims? You will not need to use this product if your levels are undetectable. While this provides food for bacteria it will most likely result in over dosing and issues such as excess bacteria such as Cyano. While using NOPOX can i still run my U/V sterilizer? Typically with Bacteria growth systems such as NoPox, Zeovit, and Bio-pellets it is not recommended to run UV sterilizers as they can keep the bacteria from repopulating in the tank as needed! Feel free to let us know if you have any further questions! This is recommended for daily use for keeping up with nitrate levels. Feel free to let us know if you have any further questions! Can I use Red Seas No3PO4x added in with my ATO/Kalk? I make up a weeks worth at a time. I'm away from home frequetly so the daily measure and addition of the liquid is not possible. It may be possible however you would need to perform some math by seeing how much Top Off water you add each day. We do not recommend this as the nopox will settle out in the RO water and not be mixed evenly. Feel free to let us know if you have any further questions! I recently moved and setup my reef tank. The tank has begun showing diatoms. Is this product recommend during the tank cycling process? Will it help rid my tank of diatoms? This product will decrease nitrate levels in the tank by feeding the bacteria and growing the population that additionally consume nitrates. Diatoms will typically not be impacted and usually will fade after a few days without light or siphoning out. I travel a lot with my job so I can't always dose daily. Can NOPOX be added with a dosing pump? There should be no issues with setting this up with an automated doser. We know of quite a few customers doing just this.